Many CubeSats are like prodigal children when launched from the International Space Station into Earth’s orbit: The miniature satellites leave home and are never heard from again. This mini satellite has performed like a dutiful child this summer, calling home at least twice a day to California State University, Northridge and doing all of its homework. After months of preparation and waiting, on April 18, electrical and computer engineering professors Sharlene Katz and James Flynn and their students cheered with relief as NASA launched CSUNSat1, the university’s first stellar explorer, to the International Space Station (ISS). The cube-shaped satellite is about the size of a shoebox and launched from Kennedy Space Center in Cape Canaveral, Fla., aboard the OA-7 Cygnus spacecraft SS John Glenn, propelled by an Atlas V rocket. It took four days to reach the space station, where astronauts unloaded and prepared the satellite and other payload for deployment. In mid-May, Katz and Flynn got word that NASA was ready to launch CSUNSat1 into orbit to start its mission. Then on May 18, the ISS crew deployed the mini satellite into low Earth orbit. Once it had safely cleared the massive space station, CSUNSat1 was allowed to power up and begin its mission operations and experiments. Later that night, the satellite made its first pass over the CSUN ground station, designed and built from scratch (like the CubeSat itself) in the corner of an electrical engineering lab in Jacaranda Hall. It was a tense and historic moment for CSUN. Katz and Flynn waited quietly in the ground station with several of the more than 70 students who have worked for four years to bring this project to life — and to orbit. The device was designed in partnership with NASA’s Jet Propulsion Laboratory (JPL) in Pasadena to test the effectiveness of JPL’s energy storage system to help explore deep space in extremely cold temperatures. At 11:21 p.m., CSUNSat1 came up over the horizon, within range of the large, custom-built antenna on the roof of Jacaranda Hall. Katz, Flynn and their students and alumni held their breath. Then, they heard it: the first contact from the beacon, the long and short tones of International Morse Code. In addition to programming it to send data back to CSUN, the engineering team had built the satellite to broadcast its status every three minutes as it circles Earth, using Morse Code. “It [broadcasts] a letter B at the beginning of the beacon that tells us the experiment is ready to be run,” added Katz, who noted that she and Flynn chose old-school Morse Code for the stellar traveler because it works when computerized data fails — and because both professors happen to be fluent in Morse Code, thanks to a passion for ham radio in their teen years. The satellite is orbiting 400 kilometers above the Earth, at Mach 22 — 22 times the speed of sound, which is at about 7.6 kilometers per second. This means that just a few minutes before it makes contact with the ground station in Northridge, it’s traveling over New Zealand. CSUNSat1 sends data to CSUN as it passes over Northridge about six times each day. 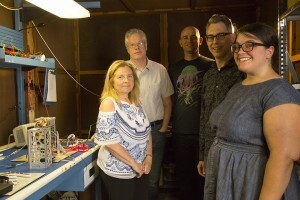 JPL assigned the team a list of tasks to complete, and by June 18 the group had checked off the entire list of experiments required for “mission success” — including switching the CubeSat to operate from its experimental battery. The tests are key for deep-space technology, to help NASA develop a battery to aid in exploration out past planets such as Jupiter and Neptune without heaters, Flynn said. Current satellite batteries require heaters to function below freezing temperatures. (L-R) Electrical and computer engineering professors Sharlene Katz and James Flynn; CSUNSat1 alumni Don Eckels ’15 (Computer Science), now working at JPL, and Benjamin Plotkin ’16 (Computer Science); and electrical engineering graduate student Rosy Davis cram into the small workshop room where they built and tested the CubeSat. June 14, 2017. Photo by Richard Chambers. The CubeSat uses solar panels to recharge its battery, and the experimental battery is designed to deliver a large surge of energy in a short period of time at very cold temperatures, Katz and Flynn said. 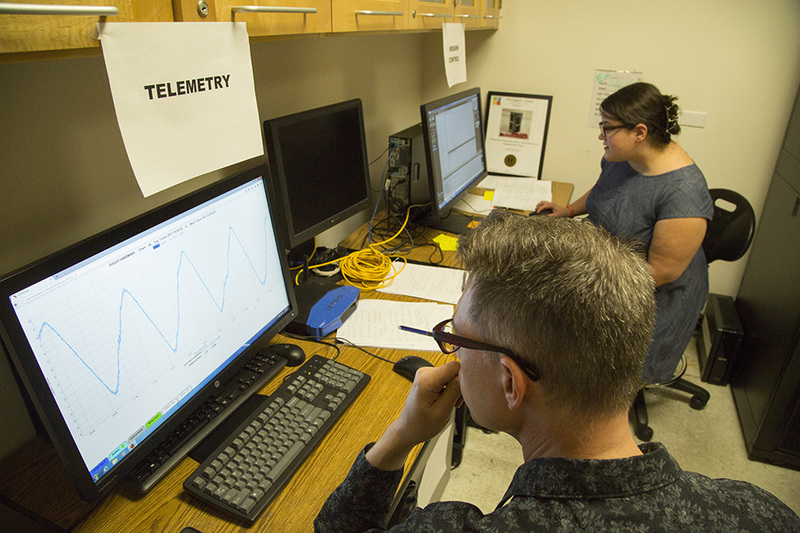 Now that the satellite is in orbit, the students have gained even more priceless hands-on engineering experience, including overcoming variables such as radiation in the planet’s orbit. CSUN was one of 14 universities selected for the orbital journey, by the NASA CubeSat Launch Initiative. Prior to selection, Katz and Flynn received a $200,000 grant from NASA to fund the project, competing against more than a hundred other applicants for 13 grants. The miniature satellite is designed for short-term use, and a short lifespan. But with this faithful child acing all of its experiments and tasks, it still has time for extra credit before it fades away. “JPL is already talking about having us do some additional experiments as an ‘extended mission,’” Katz said. The Morse Code beacon employed by the satellite makes it possible for anyone with a ham radio and interest to tune in and track CSUNSat1 as it orbits the Earth. Space and NASA enthusiasts around the globe — from the Netherlands to Brazil — have set up remote ground stations and are helping contribute to CSUN’s research and data collected from the satellite. One amateur radio enthusiast in Indiana, for example, sends the students beacon reports each morning from the Midwest, Katz said. CSUNSat1 alumnus Benjamin Plotkin ’16 and electrical engineering graduate student Rosy Davis run the telemetry and mission control stations as they monitor the CubeSat’s pass over Northridge, on June 14, 2017. Photo by Richard Chambers.